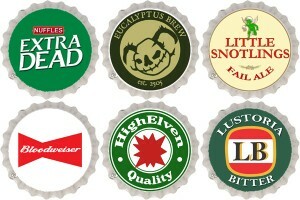 Aussie Block Dice added a cool, little extra to their Indiegogo campaign with specially-made bottlecaps. We're having a bit of fun with the Aussie theme in our IndieGoGo Campaign, and alongside the dice we're now offering "Old World" bottlecaps in a range of designs spoofing real beers. Contributors getting at least 6 sets of dice are getting some for free, and anyone can order a pack of 6 bottlecaps for just $5. Note, only contributors getting dice can add on the bottlecaps, but at just $10 USD for two sets of dice including shipping (one random, one Baggy Greens) it's very affordable to join the fun!